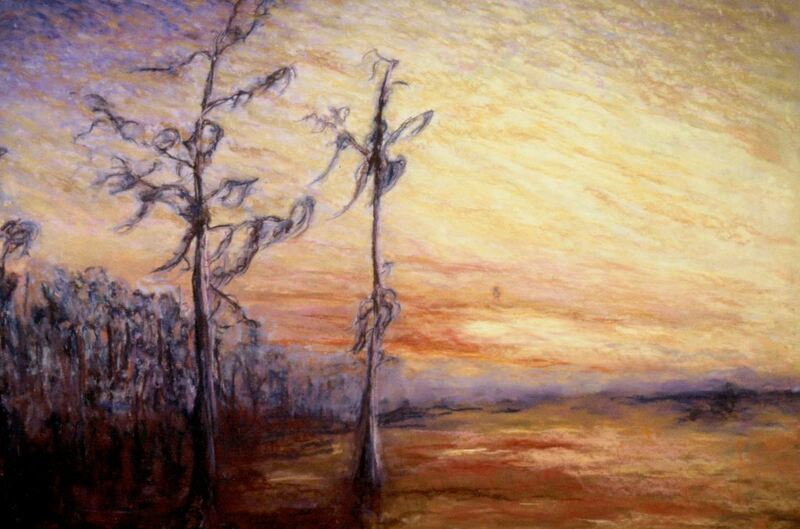 A painting of Lake Jesup in 2001 by Bettye Reagan, a local artist in Central Florida. One of the largest lakes in Central Florida, Lake Jesup is located along the middle basin of the St. Johns River. In the 1990s, after decades of pollution, the lake was cleaned up by a coalition consisting of the Friends of Lake Jesup, the St. Johns River Water Management District (SJRWMD), the Florida Department of Transportation (FDOT), and the Florida Fish and Wildlife Conservation Commission (FWC). In 2008, the Florida State Road (SR) 46 bridge was constructed by the U.S. Army Corps of Engineers (CoE) and the FDOT to cross the lake. Original painting: Reagan, Bettye. Lake Jessup Morning. 2001: Private Collection of Bettye Reagan. Digital reproduction of original painting: Reagan, Bettye. Lake Jessup Morning. 2001. "Lake Jesup Conservation Area." St. Johns River Water Management District. http://floridaswater.com/recreationguide/lakejesup/. Reagan, Bettye Jean Aulin. 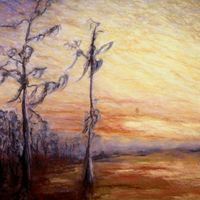 “Lake Jessup Morning by Bettye Reagan, 2001.” RICHES of Central Florida accessed April 24, 2019, https://richesmi.cah.ucf.edu/omeka/items/show/6948.